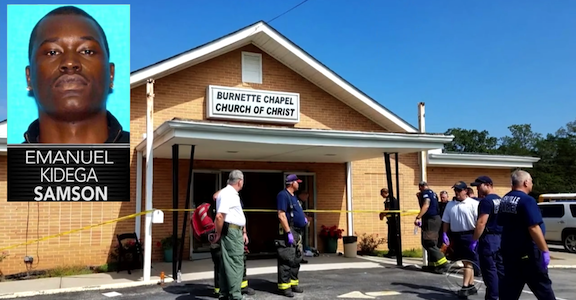 A 25-year-old Sudanese “immigrant”, Emanuel Kidega Samson, of Rutherford County, TN, carrying 2 handguns and wearing a mask, indiscriminately shot up the Burnette Chapel Church of Christ in Antioch killing 1 and injuring 7 others as church let out. The attempted mass killing could have been worse had it not been for an usher, Robert Engle, who stepped in to stop this domestic terrorist (not officially labeled as such but give it time). To add insult to injury the domestic terrorist use to attend the church but as reported hadn’t attended in approximately 1-2 yrs ago. How many more Americans must die or be severely wounded by people who shouldn’t be in America. Pres Trump just updated his executive order on travel restrictions to 8 countries, Sudan is not included. Granted Samson has been in the US for sometime, the entire north African region is hot where Sudan shares a border with both Libya and Chad that are in the order! It’s not about race, or religion it;s about stopping dangerous people from coming into the US and doing bad things to innocent people. Thankfully this domestic terrorist will be facing murder and attempted murder charges. But let this be a lesson no one is safe, if you can carry your weapon you need to. The only reason there are more injured and dead is because 1 person unarmed stepped in. Yes, Robert Engle had a gun in his vehicle, but when it really mattered he didn’t have his weapon on him to stop the initial attack. If you live in a free state start carrying your weapon!